Be the first to share your favorite memory, photo or story of Claudette. This memorial page is dedicated for family, friends and future generations to celebrate the life of their loved one. 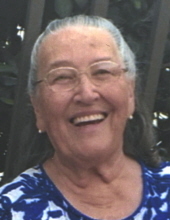 Claudette Kay “Gigi” Pahl, 80, of Fostoria, passed away at 6:20 pm Thursday April 4, 2019 at her home. She was born in 1938 in Fostoria to the late August V. and Margaret M. (St. Clair) Huether. She married Richard E. “Eddie” Pahl November 28, 1955 in Angola, IN and he preceded her in death October 19, 2012. Surviving are four children, Jeffery M. Pahl, Risingsun, Peg Pahl, Fostoria, Becky (John) Roberts, Fostoria and Douglas E. (Michelle) Pahl, Tiffin; 11 grandchildren, Jeremy Pahl, Jill Wagner, Cara and Chaila Costilla, Nicholas, Elise and Sophie Pahl, Morgan Naugle, Matthew Decker, Steven and David Roberts; 14 great-grandchildren, Kaitlynn, D J, Elonzo, Andres, Deacon, Devin, Jalen, Stevie, Davie, Keke, Robbie, Maci, Jaxon and Esperanza; and a brother, George “Joe” (Lina) Huether, Gibsonburg. She was also preceded in death by a grandson, Robby Roberts; brother, Raymond Huether; and sister, Mary Winans. Kay retired from Allied-Automotive, Fostoria as a production checker after 30 years of service. She was a member of St. Wendelin Catholic Church where she had served as a Eucharistic Minister. She was loyal to her family and supported them with her love and care. She was a complete homemaker, always cooking, sewing and baking. She will be fondly remembered for her passion for Elvis music and always enjoyed the opportunity to do a little gambling. Visitation is Tuesday April 9, 2019 from 2-4 & 6-8 pm at HOENING & SON FUNERAL HOME 133 W. Tiffin St., Fostoria. Mass of Christian Burial is 10:30 am Wednesday at St. Wendelin Catholic Church with Rev. Todd Dominique officiating. Burial will take place in St. Wendelin Cemetery with a luncheon then following at the parish hall. Memorials are suggested to the Fostoria Sharing Kitchen, St. Wendelin Church or Bridge Hospice Care. To send flowers or a remembrance gift to the family of Claudette Kay "Gigi" Pahl, please visit our Tribute Store. "Email Address" would like to share the life celebration of Claudette Kay "Gigi" Pahl. Click on the "link" to go to share a favorite memory or leave a condolence message for the family.